Christian Wilhelm Ernst Dietrich (October 30, 1712 – April 23, 1774), German painter, was born at Weimar, where he was brought up early to the profession of art by his father Johann Georg, then painter of miniatures to the court of the duke. 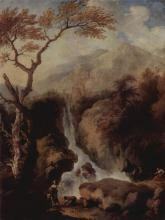 Having been sent to Dresden to perfect himself under the care of Alexander Thiele, he had the good fortune to finish in two hours, at the age of eighteen, a picture which attracted the attention of the king of Saxony. Augustus II was so pleased with Dietrich's readiness of hand that he gave him means to study abroad, and visit in succession the chief cities of Italy and the Netherlands. There he learned to copy and to imitate masters of the previous century with a versatility that was truly surprising. 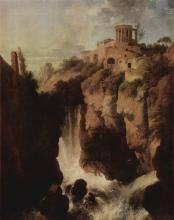 Winckelmann, to whom he had been recommended, did not hesitate to call him the Raphael of landscape. 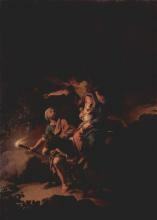 Yet in this branch of his practice he merely imitated Salvator Rosa and Eveidingen. 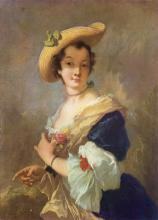 He was more successful in aping the style of Rembrandt, and numerous examples of this habit may he found in the galleries of St. Petersburg, Vienna and Dresden. At Dresden, indeed, there are pictures acknowledged to be his, bearing the fictitious dates of 1636 and 1638, and the name of Rembrandt. Among Dietrich's cleverest reproductions we may account that of Ostade's manner in the Itinerant Singers at the National Gallery. 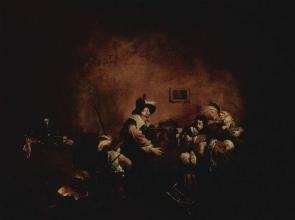 His skill, in catching the character of the later masters of Holland is shown in candlelight scenes, such as the Squirrel and the Peep-Show at St. Petersburg, where we are easily reminded of Godfried Schalcken. Dietrich tried every branch of art except portraits, painting Italian and Dutch views alternately with scripture scenes and still life. In 1741 he was appointed court painter to Augustus III at Dresden, with an annual salary of 400 thalers, conditional on the production of four cabinet pictures a year. This condition, no doubt, accounts for the presence of fifty-two of the master's panels and canvases in one of the rooms at the Dresden museum. Dietrich, though popular and probably the busiest artist of his time, never produced anything of his own; and his imitations are necessarily inferior to the originals which he affected to copy. His best work is certainly that which he gave to engravings. 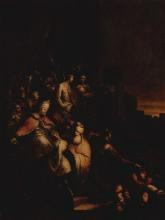 A collection of these at the British Museum, produced on the general lines of earlier men, such as Ostade and Rembrandt, reveal both spirit and skill. Dietrich, after his return from the Peninsula, generally signed himself Dieterich, and with this signature most of his extant pictures are inscribed. 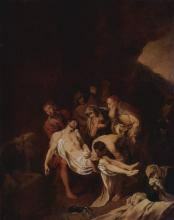 He died at Dresden, after he had successively filled the important appointments of director of the school of painting at the Meissen porcelain factory and professor of the Dresden academy of arts.